You are here: Home / Domesticity / Beans means……. There are some things you need when you’re feeling unwell. One of the is food that will comfort you. Imagine my delight when I found out that my dear husband had snuck one of our favourite comfort foods into the shopping trundler as we stocked up on our holiday provisions. Although we’re now having staycation no sense in wasting the goodies. Also it would do much to help my aching body. Feed a cold and starve a fever I think the saying goes. You may be wondering why the obsession with beans. 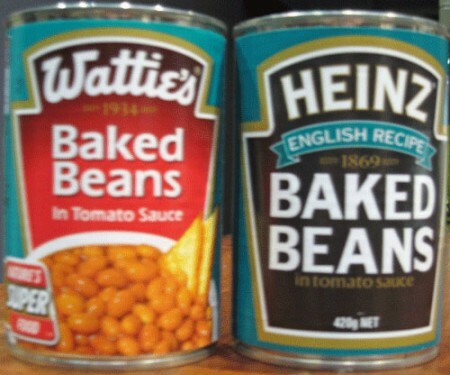 Here in kiwi land the staple beans brand is Watties. 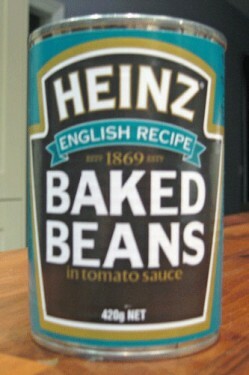 Incidentally also owned by Heinz. You could be forgiven for thinking that’s ok you’d get the same product just with a different label. Oh how wrong you’d be. Watties are just not the same. Sweeter, more sickly and just all round less satisfying to eat than the real thing. 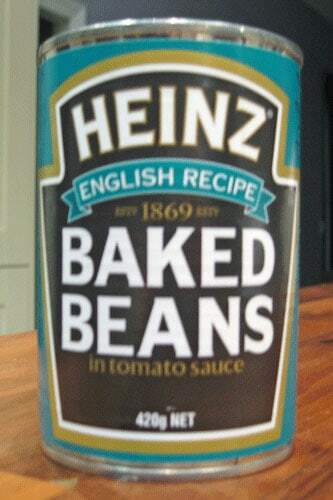 When I opened the can to heat them up Heinz beans just smelled like beans should. Watties don’t really smell and they are a worrying shade of orange too. Anyway, suffice to say we enjoyed our comfort food on a night when we got the tail of the mega storm lashing New Zealand. Anything from Waitrose – especially aromatic crispy duck with pancakes! I can however live without such things and have even come to tolerate Watties beans. They may be trying to con me with the packaging but I’m not buying it! What are the sorts of things you miss most about being away from home? Go on, do tell. This girl needs something to cheer her up! Previous Post: « It’s a really really big one this time! Kiwis are generally pretty hopeless at deserts – I have not found a decent jam roly poly or bread & butter pudding or even a treacle tart since I’ve been here. On the other hand, we do get excellent local cheeses, sausages and local produce (asparagus and cherries especially but only for a few precious weeks). And some outstanding pies. I have also found marmalade that is quite the match for anything I’ve ever tasted back in Blighty. Welly has a really good organic butchers about 100 yards from my office- really good steaks, pork belly and, lord preserve us, black pudding. Regular readers will be reassurred to know I’ve found a regular supply of Fullers ale and even, one bright sunny day, managed to sniff out a rare consignment of Adnams hidden in a dusty corner of a (rather good) beer & wine shop tucked behind Basin Reserve. Sorry to hear you’re under the weather Julie. When I go to visit my (English) friends Jane and Dave in Holland, I’m asked to take Tetley tea bags, crumpets, HP sauce and I smuggle in cheddar cheese and sausages! However, some enterprising ex-pat has now set up a website over there where you can buy quite a few English goodies, at a price e.g. a tin of Heinz tomato soup, is about £2! Did you forget to put M&S’s Percy Pigs on your list? You know, I’m not a child… but when i go on vacation I really miss my blanket. It’s a beautiful thick thing that feels like wrapping up in a heavenly cloud. As far as comfort food goes… I love … hrm… I like Beef Jerky and Buffalo wings, but I generally don’t get “comfort” from food, that’s the path to the dark side. Here’s a tip for making cheap own brand beans taste much better, discovered as a result of having 3 sons and little money. Add a generous dollop of tomato ketchup to the beans. This might help make the NZ beans taste better. Also I’ve always kept a few hens and apart from daylenght being crucial to egg production I’ve found they will stop laying if it is too wet, too cold, too hot or as has happened now one of the hens goes broody. Current flock of hens are a mix of ex-battery hens,Warrens, and home bred hens, Marrams and Black Rock. Good luck with the egg production. Thanks for the tip Ruta – I’ll try that out. Sounds like you have quite a brood of chickens – we’ve had three eggs now and I’m still as eggcited (sorry!) as I was when the first arrived. When my parents were here on their hols early this year they actually took things out of their suitcases to make room for their stock of Watties products. I also agree that Watties is far superior to Heinz any day!! We have just returned from the storm in Levin (our holiday) and whilst the power was on we visited the local New World. We were totally shocked but wonderfully suprised to see a whole shelf dedicated to the English imports. I will admit we did buy a few products, as there are some things you can never replace but we had to draw the line when a small bag of bacon fries was nearly $3!! Wow, a whole shelf of British goods! Bet you might have thought you were in Tescos for a moment. Maybe not! Am on the mend, thanks! I see that you’re part of the bean sniffers guild.